Alberto ‘Explosivo’ Machado is not only eager to avenge his lone career defeat, but is willing to return to the scene of the crime in order to accomplish the feat. 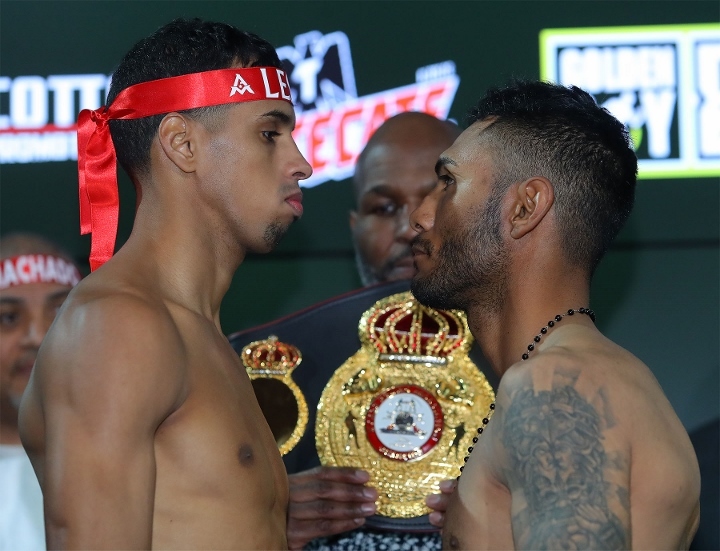 Talks remain ongoing for the former 130-pound titlist from Puerto Rico to run it back with his conqueror, newly crowned title claimant Andrew Cancio. The rematch—should it happen—will take place June 8 at Fantasy Springs Casino in Indio, Calif., where Cancio rose from the canvas to stop a weight-drained Machado in four rounds this past February. The bout is not yet finalized, but also not on the verge of falling apart as speculated elsewhere in recent days. Also included on the show is Machado’s fellow Boricua stablemates, reigning 108-pound titlist Angel Acosta (20-1, 20KOs)—as previously reported by BoxingScene.com—and rising 140-pound prospect Danielito Zorrilla (11-0, 9KOs). Cancio (20-4-2, 15KOs) will defend his title on the date, regardless of opponent. The 30-year old from Blythe, Calif. has emerged as boxing’s latest feel-good story, taking on a full-time as a construction technician for Southern California Gas Company after stepping away from the game in 2016 following a knockout loss to Joseph Diaz Jr.
Three wins have followed since his ring return last April, none bigger than his massive upset over Machado (21-1, 17KOs) earlier this year. Canclo had to climb off the deck to do so, managing to recuperate quick enough to overwhelm the previously unbeaten titlist in their February bout on DAZN. The passing of the torch was eerily similar to the manner in which Machado won the title. His violent ascension to the top came in an 8th round knockout over Jezreel Corrales whom had already conceded the title at the scales after missing weight. Waiting in the wings for Cancio should a return go with Machado not materialize is yet another potential rematch. His current mandatory challenger is Rene Alvarado, whom Cancio stopped in the 8th round of their Dec. ’15 meet in this very venue where the reigning titlist boasts a 9-1 record. For now, though, he should remain focused on the man from whom he lifted the title—since revenge very much remains the plan on the other side of the equation. ← Will this be the last match for Triple H or Batista?